Built in 2003, Hy-Line Cruises Grey Lady can reach an impressive top speed of 37.3 knots. On board you’ll find snack bars offering freshly made, high quality sandwiches, wraps and salad, as well as a wide variety of snacks and sweets and soft drinks. 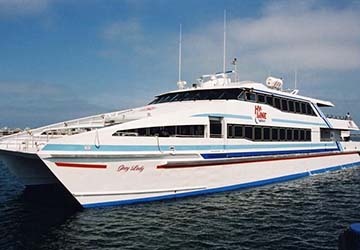 Hy-Line Cruises also have a fully stocked bar, featuring local and regional beers, fine wines and spirits. 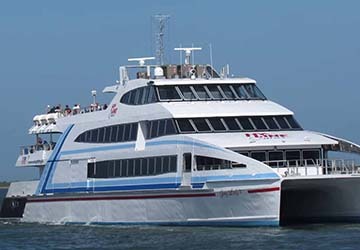 Please Note: Whilst we have taken great care in making our Grey Lady guide as accurate as possible, onboard facilities, services and entertainment may vary depending on the date and time of year that you travel, facilities mentioned may change without notification and ferry companies reserve the right to operate vessels other than those mentioned at time of booking without prior notification.